No, you're not missing anything. It definitely is pricey for what it does. The only other thing it does is to allow you to disable the "no navigation entry while in motion" lockout. You can also toggle between the backup camera and four other inputs while driving. However, I couldn't find an area in the cabin to mount an additional display. Reusing the MFT display was the only way I could do what I wanted to. I suppose you could have done a little dot matrix 1.5" LCD or something driven directly from the Arduino, but I wanted a larger color display that I pack a bunch of information on. What module reports this? I haven't noticed this in FORScan... It would be useful to see. Thanks! I really like your customized FFE display screen. Thanks for sharing more info about your work! Unfortunately this is not a stock reported parameter. I created this parameter by monitoring motor torque for being negative (indicating it's in regen) and hydraulic brake pressure (indicating the friction brakes are operating). You could monitor this by looking at the brake pressure from the ABS module and noting when it goes >0 PSI, indicating the friction brakes are on. That explains why I hadn't found it. I have seen the brake pressure PID in the ABS module. Thanks! Can we get a instructions list of how you did this? I'd really love to do this down the road from now, after I buy my FFE. I made some progress today on my project to add additional charging capability and/or add chademo capability. Today I used a brusa charger to charge the battery via the high voltage junction box. When you say the "high voltage junction box", what exactly are you talking about and where is this located on the FFE? I'm trying to figure out where you 'inserted' your additional power source. 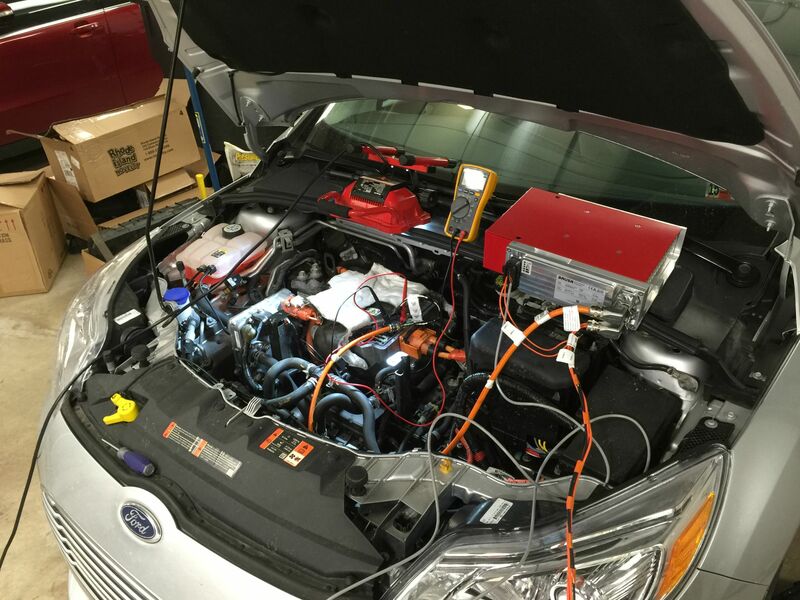 Did you insert power on the battery-side of the Battery Charger Control Module (BCCM), or the charger port side of the BCCM? Again, nice work on your project. It has been keeping me entertained all day! he tapped into the battery by removing the top cover of the motor/drive/gearbox assembly. Not sure what the proper term is. You have to remove the black plastic cover and then it's a few screws to pop the top cover off. If you look at the center of his picture you can see the metal cover is missing. It should go without saying that this will expose the high voltage so don't be stupid and electrocute yourself. This is it. Ford calls this entire motor/gearbox/junction the TCM.